Excited for a new internship...and a summer in Athens! It&apos;s hard to say what my favorite thing is about Athens. It might be the restaurants downtown that serve up local, home-grown fare from a farm only a few miles down the road. It could be the eclectic mixture of music, from bluegrass to jazz, that you can hear coming from inside clubs and music halls as you walk through town on a warm Friday night. It might also be the wonderful, southern hospitality of the people who live here, who always greet you with a smile on their face. Or maybe my favorite thing about Athens is that I can&apos;t actually pick a favorite thing about Athens. 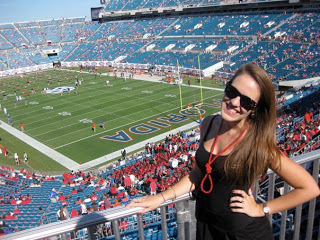 My name is Sarah Varner, and I&apos;m a few months away from beginning my senior year as a public relations major at the University of Georgia. I&apos;m writing to you as one of the new PR and social media interns for the Athens Convention &amp; Visitors Bureau, and I hope that this internship will allow me to find out even more things that I love about this town. In my three years as a student living in Athens, I&apos;ve taken advantage of many of the opportunities that the city has to offer. From walks through the State Botanical Garden to tubing down the Broad River, from trips to the Athens Farmer&apos;s Market and shows at the 40 Watt, I have gotten a taste of the wide range of activities that go on year-round in Athens. But there&apos;s still so much more that I want to do, and try, and eat, and visit while I&apos;m here. As an intern for the Athens CVB, I will be writing about all of the events going on in Athens, and hopefully giving you a better glimpse at all this city has to offer. And if you&apos;re like me, you&apos;re going to find out about events and activities you didn&apos;t even know existed, and you&apos;re going to want to try them all. So it&apos;s time to start making your Athens "To-Do" list, because I&apos;m going to be giving you things to put on it all summer long!